Boron atoms have 5 electrons and the shell structure is 2.3. The ground state electronic configuration of neutral boron is [He].2s2.2p1 and the term symbol of boron is 2P1/2. Boron: description Your user agent does not support the HTML5 Audio element. 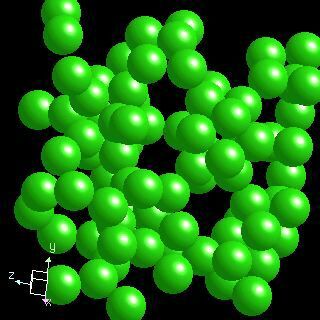 The solid state structure of boron is: bcc (body-centred cubic). Boron is probably not required in the diet of humans but it might be a necessary "ultratrace" element. Boron is required by green algae and higher plants. Reactions of boron as the element with air, water, halogens, acids, and bases where known. Binary compounds with halogens (known as halides), oxygen (known as oxides), hydrogen (known as hydrides), and other compounds of boron where known. Bond strengths; lattice energies of boron halides, hydrides, oxides (where known); and reduction potentials where known. Boron was discovered by Sir Humphrey Davy, Joseph-Louis Gay-Lussac, L.J. Thénard in 1808 at England and France. Origin of name: from the Arabic word "buraq" and the Persian word "burah" . 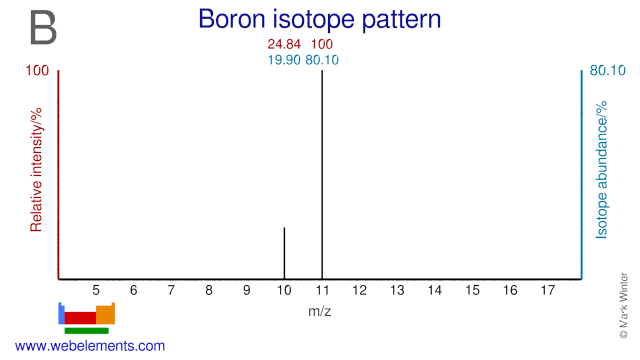 Isotope abundances of boron with the most intense signal set to 100%. 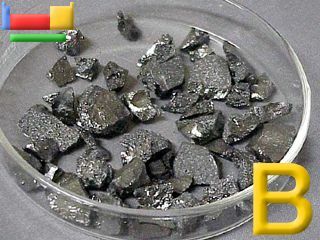 Both isotopes of Boron, B-10 and B-11, are used extensively in the nuclear industry. B-10 is used in the form of boric acid as a chemical shim in pressurized water reactors while in the form of sodium pentaborate it is used for standby liquid control systems in boiling water reactors. B-11 can be used as a neutron reflector. Outside the nuclear industry both isotopes are used as food label to study boron metabolism. B-10 is also used in so-called boron neutron capture therapy (BNCT). Both B-10 and B-11 can be used for the production of two radioisotopes: C-11 and N-13.